Barney came to live at the Kasper home on April 9, 1990. I found Barney playing in traffic behind the local mall. 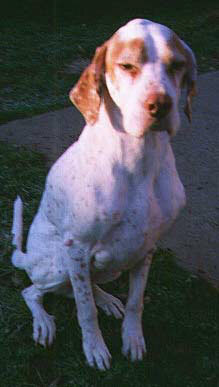 An old man walking nearby told me that someone had abandoned the young pointer in the street. The first time I saw Barney I knew that he was something special. He was energetic and playful, and somewhat mischievious. Yet, Barney was initially distrustful of newcomers. I suspected that his old owners had abused him, but with our love and attention, Barney developed into a thoroughly lovable and loving companion. And although I already had two other dogs, Max and Guinevere, Barney soon became the top dog, both in the house and in our hearts. Barney lived with us for over ten years. During that time, Max and Guinevere passed on, and he acquired several new brothers, Teddy, Rudi, and Kasey. Barney brought both my husband and me years of joy and laughter. Sadly, Barney passed away on February 5, 2001. My husband and I miss Barney terribly, but I know that he is up there in dog heaven looking down on us and his brothers and smiling.